The Cook County Jail in Chicago has initiated a policy of using detainees’ gender identity instead of their birth gender to determine where they will be housed, making it one of the few in the nation to do so, Windy City Times reports. 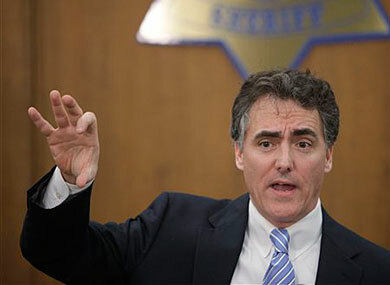 In an exclusive interview with the paper, Sheriff Tom Dart (pictured) said the policy went into effect last month. It allows transgender detainees to go before a gender identity panel of physicians and therapists before being placed in quarters for men or women, and to have clothing and hygiene products that are consistent with their gender identity. It also mandates training on gender issues for correctional staffers. Dart said he was moved to create the policy when he discovered over a year ago that there was none, except for an outmoded, offensive, and potentially dangerous set of guidelines dating from 1984. The sheriff’s department collaborated with health care professionals, activists, and other experts to devise the policy. “Particularly with this issue, we wanted to do it right,” he told the Times. Some other jails, such as San Francisco’s, house detainees based on their gender identity, but the Cook County program may be the first in the nation to use a panel of medical experts, not just corrections staff, in that process, officials said. Activists for transgender rights welcomed the policy but expressed some skepticism as well. Owen Daniel-McCarter, an attorney with the Transformative Justice Law Project of Illinois, said it is “a step forward” and “commendable,” but noted that it uses the concept of gender identity disorder, which has become controversial, and that his group was not consulted on it. “I don’t like that this was sprung on us,” he told the Times. Still, he said, the policy is the “most progressive” in the state.